Guide Vanes are fixed grooves found in turbines that help direct water, gas, or air around bends at maximum efficiency. 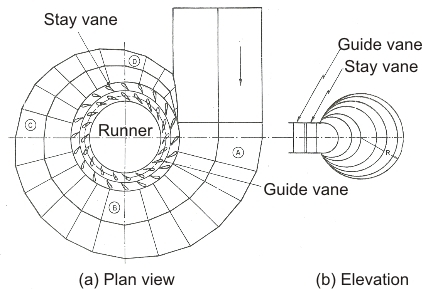 As Impellers increase or decrease the flow of a substance through a system, Guide Vanes ensure that the substance is passed evenly and as smoothly as possible. One way to compare these vanes is to compare them to rifle barrels. As firearms evolved, they were manufactured to have small spring-patterned grooves in the barrels. This allowed the projectile to spin as it left the barrel, making the projectile more accurate. Guide Vanes work in this way. Decreasing surface area resistance in both examples only improves efficiency.